With the release of Update 9.1, we'll be seeing a new addition to the current Historical Battles roster: the Siege of Tobruk, featuring German tanks clashing against Allied forces. If you're a history buff or just someone who wants every last scrap of information about the upcoming Update, you'll want to learn more about the story behind this particular battle, summarised in a brief writeup below. Once you're done with those, you'll get to see some cool in-game screenshots for the scenario. During the Second World War, Tobruk was a port town in Cyrenaica on the Mediterranean Coast. Both sides of the conflict needed control of the town in order to ensure a steady supply line for offensive operations, which was why Tobruk was vital for both Axis and Allied forces. On January 22nd, 1941, Allied forces managed to capture the town, having defeated the Italians and captured a significant amount of trophies and hostages. These events concerned German authorities. In order to even the situation, German forces were sent to Africa, with Erwin Rommel as commander. Rommel conducted a sudden assault on March 31st.Allied forces were caught unawares – it was assumed that German forces would require far more time to transfer and coordinate the army properly. 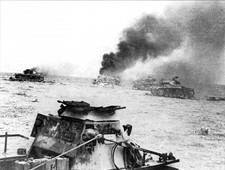 By April 4th, the Italo-German forces occupied Benghazi (a nearby port town) and advanced towards Tobruk. Meanwhile, the defending Allies were relieved by the British 8th Army, commanded by Lieutenant-General Alan Cunningham. Tobruk was defended by the 9th Australian Division, the 18th Infantry Brigade, the 7th Australian Division, and about 1,500 Indian soldiers. The defenders of Tobruk had about 60 tanks in service. Lieutenant-General Leslie Morshead was in overall command of the defending forces. On April 14th, the enemy struck along the southern frontline, disrupting defenses and advancing 3 km northward before they came under heavy artillery fire and had to move back. Later on, they were forced back even further to their initial positions due to counter-attacks by the Australian divisions. On April 15th, the Italian Arieto division (reinforced by an infantry regiment from Trento division) made an attempt to assault the western defenses of the town. These attacks were unsuccessful. On the evening of April 30th, Rommel mounted another major assault on Tobruk. Despite heavy losses from Allied fire from pillboxes and minefields, the Italo-German forces seemed to be close to breaking through the defensive line. Rommel tried to expand the breakthrough by throwing more units into the fight, but the Australians held firm. Fighting continued until May 4th when the assault was called off. The siege continued, and ultimately lasted until November 1941. On November 18th, British troops commanded by Lieutenant-General Alan Cunningham launched a counteroffensive from Mersa Matruh, advancing northwest (“Operation Crusader”). The battle at Sidi Rezegh left Cunningham’s forces badly depleted, but Rommel suffered losses as well, and his supplies were dwindling. On November 27th, the 2nd New Zealand Division was able to link up with the 70th British Infantry Division. Tobruk was relieved. The exceptional persistence and courage of Tobruk’s defenders played an important role in holding the strategically crucial town, and perhaps succeeded in preventing Italo-German troops from gaining access to the Suez Canal. The towns of Halfaya and Bardia were seized with some 30,000 Axis troops captured. But most importantly, “Operation Crusader” demolished the myth of Rommel’s invincibility. Even though more difficult battles await the allies in Africa, this battle paved the way forwards to the defeat of Axis forces.